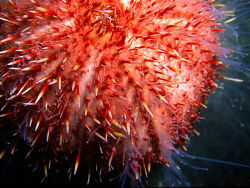 Sea urchins are marine invertebrates that actual can be found in almost every major marine habitat around the globe. 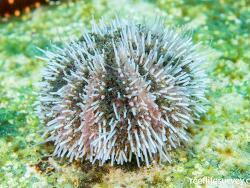 There are at present around 800 extant species, they belong to the Echinoidea, one of the five classes of the phylum Echinodermata. 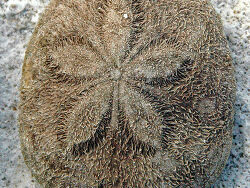 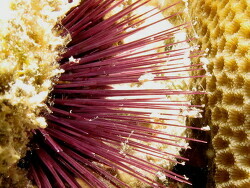 Like all echinoderms, Sea urchins have a skeleton composed of calcitic plates embedded in their skin. 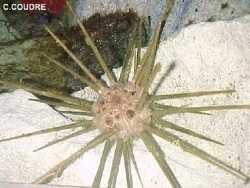 This skeleton has a very particular structure, termed stereom. 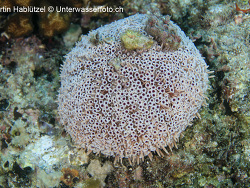 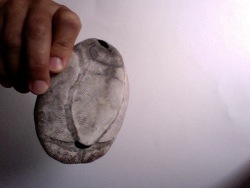 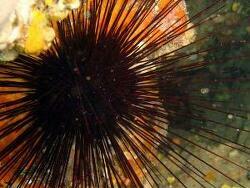 In almost all groups of Sea urchins the plates are firmly bound together to form a solid skeleton, called the test. 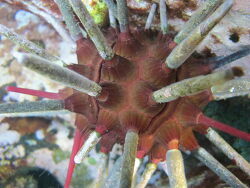 Plates in the test are arranged into columns radiating from an aboral apical zone to the mouth. 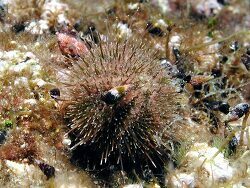 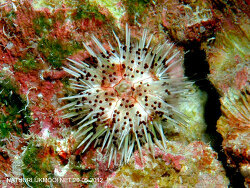 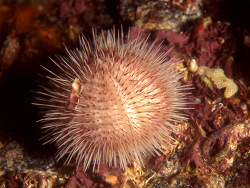 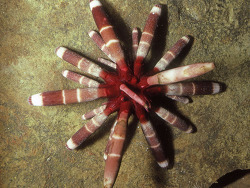 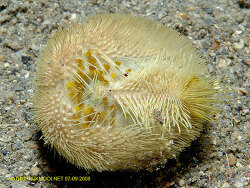 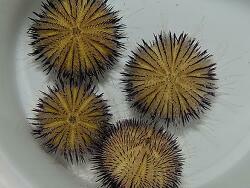 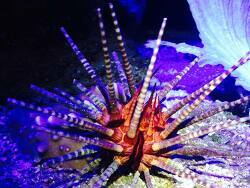 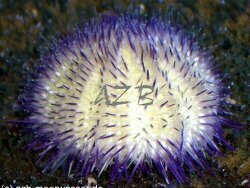 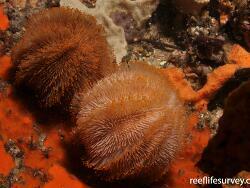 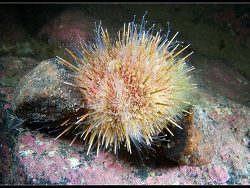 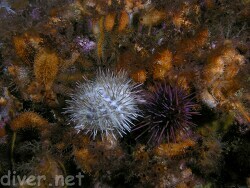 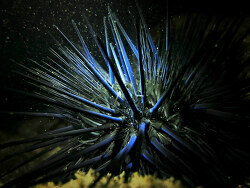 All echinoderms have tube-feet and in Sea urchins these play a very important role in feeding and respiration. 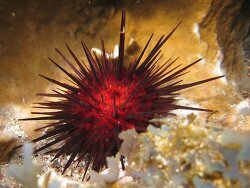 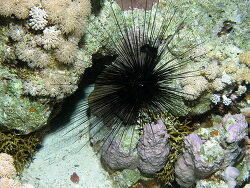 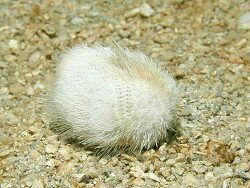 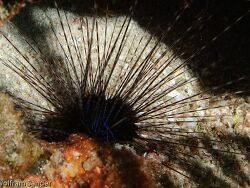 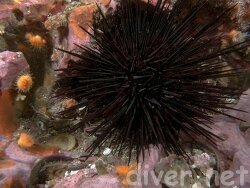 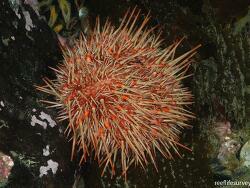 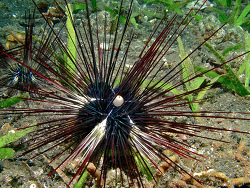 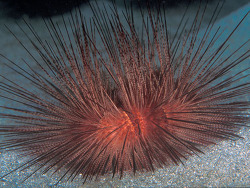 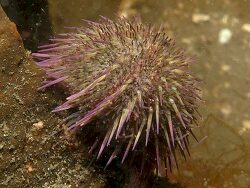 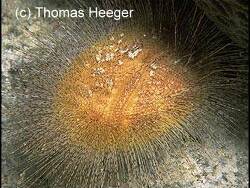 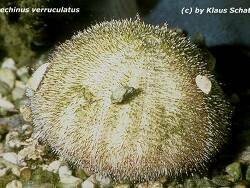 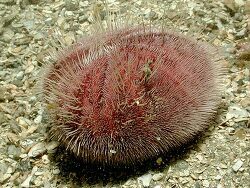 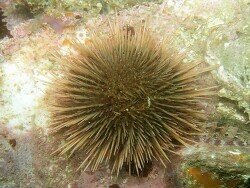 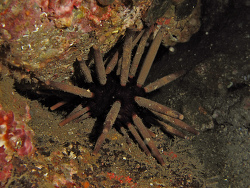 Sea urchins move by means of spines and climb and cling on to hard substrata by means of their tube-feet. 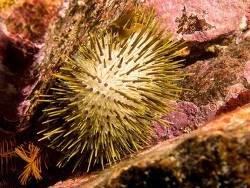 The spines also offer the primary means of defence. 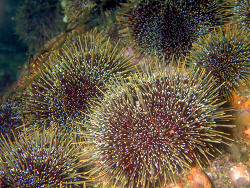 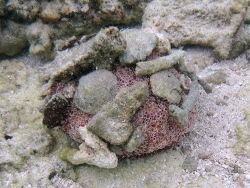 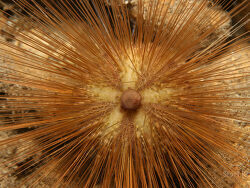 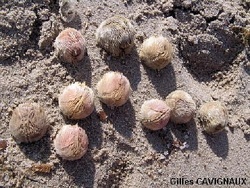 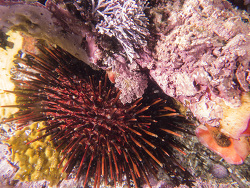 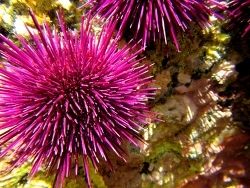 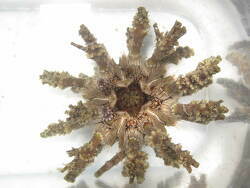 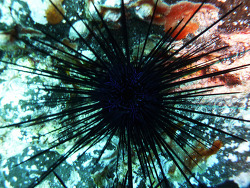 Sea urchins feed in a variety of ways. 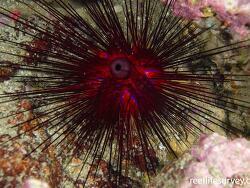 Regular they have a powerful internal jaw and graze on algae or sedentary organisms. 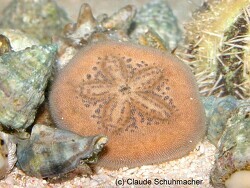 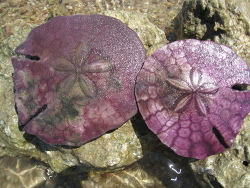 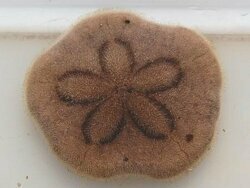 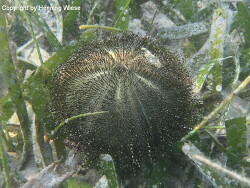 Sand dollars bulk-process sands to feed on the tiny organic particles trapped in the sediment, while heart urchins are selective deposit feeders, using specialised tube-feet to pick up organic-rich detritus from the sediment. 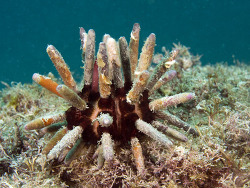 Getting oxygen into the body and removing waste gases such as carbon dioxide, is carried out by the tube-feet. 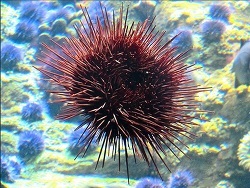 Circulating fluid passes constantly from the internal ampullae to the external tube-feet and back into the ampullae in a one-way system, and gases diffuse across the thin walls of both external and internal organs. 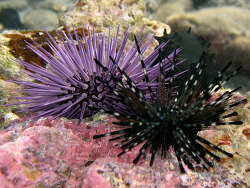 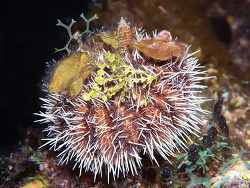 Sea urchins can feed in a variety of different ways. 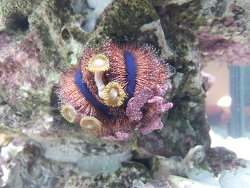 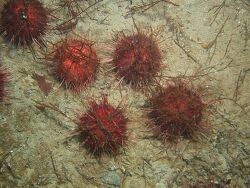 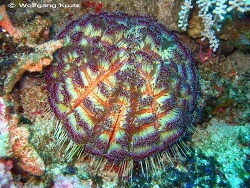 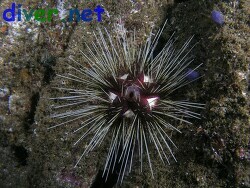 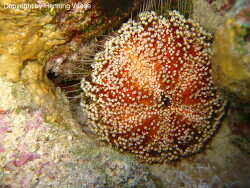 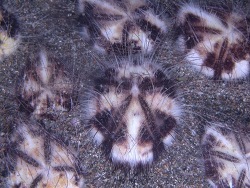 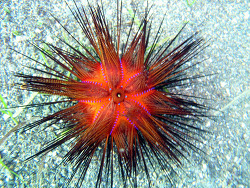 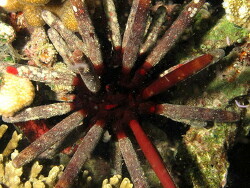 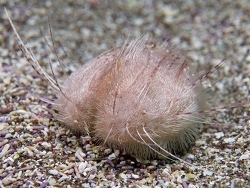 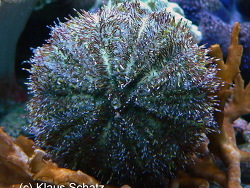 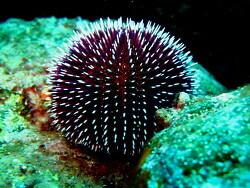 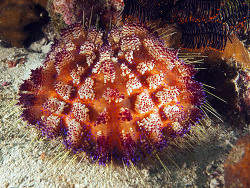 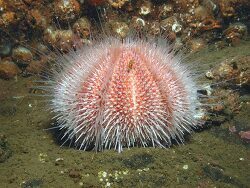 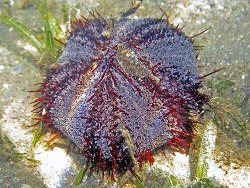 Regular Sea urchins feed primarily using their lantern to bite and rasp. 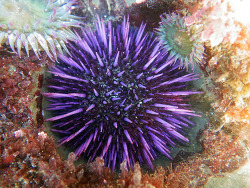 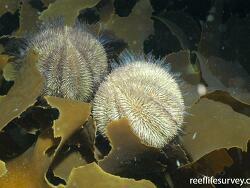 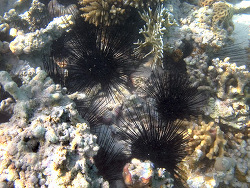 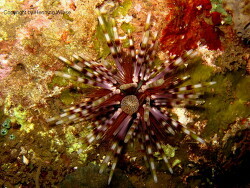 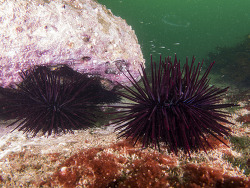 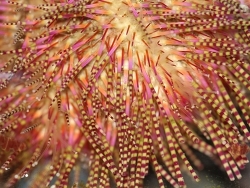 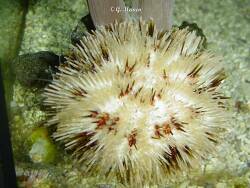 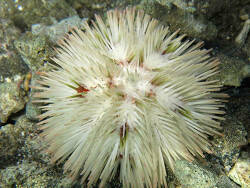 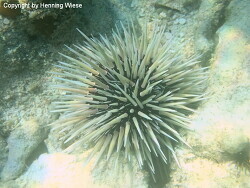 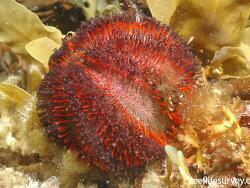 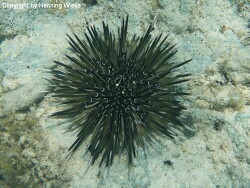 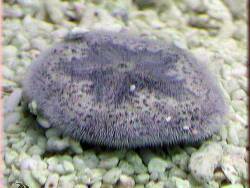 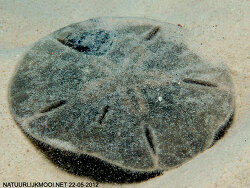 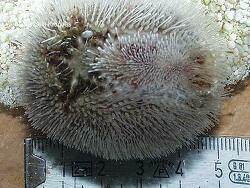 Many shallow-water Sea urchins are almost exclusively algivores, feeding on seaweeds, grasses and encrusting algae. 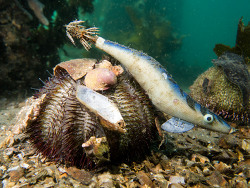 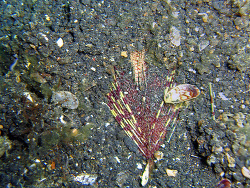 Others are more generalist, feeding on sessile organisms, carrion and detritus on the sea floor.